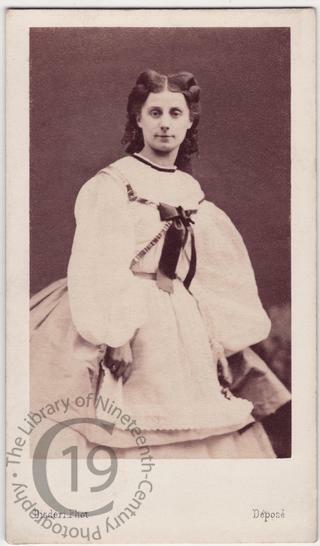 Born in Paris on 26 April 1842, Mlle Léontine Beaugrand was a dancer with the Paris Opéra. Although technically not very strong, she had a soft and gentle manner and became one of the company’s principal dancers during the 1860s and 1870s. During the siege of Paris, she organized groups to collect food and worked in the soldier's hospital in the basement of Comédie Française. After the siege, she revived Coppelia with herself in the title role, and Eugenie Fiocre repeating her role of Franz. In 1877 she premiered Mérante’s Le Fandango. She retired in 1886 and died in Paris on 27 May 1925. Photographed by A. A. E. Disdéri. A pencilled inscription identifies the sitter as 'Mlle Beaugrand dans La Maschera'. The choreographer Giuseppe Rota created the ballet La Maschera, ou Les Nuits de Venise (The Mask, or Venetian Nights) in 1864.